“The wage and employment statistics out today, the last before the election, show how the Government has failed workers over its two terms,” says CTU President, Helen Kelly. “Unemployment has at last fallen below 6% but at 5.6% and 137,000 people, it is still far higher than the 3.5% in December 2007 – so we know we can and should do much better. Despite the luck of booming dairy sales (now running out) and lots of jobs created for the Canterbury rebuild, which account for half of the growth in employment during the year, the Government has created a record of 20 quarters – five years – with unemployment higher than Australia. We usually have lower unemployment than Australia: over two-thirds of the time since 1986.” Kelly said. “This is the first quarter to end that appalling record, but reflects temporary factors, not a permanent turn around in jobs. On top of the 137,000 unemployed are 104,500 looking for work but not officially classified as unemployed – up from 97,200 a year ago. The number of part-time workers wanting more hours has risen from 87,500 to 98,200 over the year.” Kelly said. In the late 1980s and early 1990s, workers in New Zealand suffered a massive setback in their levels of union and social organisation and their living standards. A neo-liberal, Labour Government elected in 1984 began the assault and it was continued and deepened by a National Party government elected in 1990. The “free trade”policies adopted by both Labour and the National Party led to massive factory closures. The entire car industry was eliminated and textile industries were closed. Other industries with traditionally strong union organisation such as the meat industry were restructured and thousands lost their jobs. Official unemployment reached 11.2% in the early 1990s. It was higher in real terms. Official unemployment for Maoris (who make up 14% of the population) was 30%, again higher in real terms. Working class communities were devastated. The National Party government presided over a deep and long recession from 1990-1995 that was in part induced by its savage cuts to welfare spending and benefits. They also introduced a vicious anti-union law. When the Employment Contracts Act was made law on May Day 1990, every single worker covered by a collective agreement was put onto an individual employment agreement identical to the terms of their previous collective. In order for the union to continue to negotiate on your behalf, you had to sign an individual authorisation. It was very difficult for some unions to manage that. Many were eliminated overnight. Voluntary unionism was introduced and closed shops were outlawed. All of the legal wage protections which stipulated breaks, overtime rates, Sunday rates and so on, went. Minimum legal conditions were now very limited – three weeks holiday and five days sick leave was about the lot. Everything else had to be negotiated again. It was a stunning assault on working people. Union bargaining, where it continued, was mostly concessionary bargaining for the next decade. Moves that effectively remove the right to collective bargaining reinforce the Government’s assault on the wages of working Kiwis. In his first term as Prime Minister, John Key made a determined effort to be all things to all men – and women. In his second term, however, he hasn’t bothered; he has clearly calculated he can still win an election while overtly tipping the balance of advantage further in favour of the better off and against those struggling. The evidence for this can be seen, for example, in the alacrity and openness with which he meets the demands of big business; but nowhere is it more apparent than in the burdens he is increasingly ready to place on working people. The ranks of the poor in New Zealand have been increased in recent years by the unemployed and their families. The Key Government’s indifference to their plight has been one of the least appealing aspects of its skewed order of priorities. But what has attracted less attention, perhaps, is the pressure now being put on families that depend on the earnings of those in work. We have come a long way since the heady days of John Key’s commitment to close the wages (and living standards) gap with Australia. Far from trying to lift wages, the Government is engaged in an undeclared campaign to depress real wages still further. And that is from a starting point where low wages were already the central element in the widening income gap in New Zealand. We suffered the fastest widening of inequality of any country in the last two decades of last century, and remain dishonourably in the top group. The top 10 per cent of income earners enjoy today an income nine times greater than the income of the bottom 10 per cent, up from five times in the 1980s. As Treasury research shows, New Zealand households in the lower half of the income range had no increase in real incomes between 1988 and 2010; all the increase in national income over that period went, in other words, to those who were already better off. Although labour productivity in the private sector rose by 48 per cent over a similar period (1989 to 2011), the average hourly wage rose in real terms by only 14 per cent. The price we have paid for this intensification of inequality is not just financial. As workers’ rights at work have weakened, our shameful record on health and safety at work has worsened. In industries like forestry, where employees work long hours in a virtually deregulated workplace and labour costs as a proportion of total costs have fallen sharply, the rate of industrial accidents remains unacceptably high. It is against this background that the Government has intensified its assault on the ability of ordinary people to protect their living standards and safety at work. That assault has taken the form of a whole range of measures, such as maintaining the minimum wage at a level that is inadequate to halt the increase in family and child poverty and introducing a young workers’ wage even lower than the minimum wage. Low-paid workers in industries such as aged care are still expected to accept minimal wage increases that mean a further fall in their living standards. The unemployed are forced by benefit cuts and tighter rules about eligibility to try their luck in a labour market where there are few new jobs so that they are forced to try to undercut those in jobs that are already low-paid. These factors are not accidental. They seem part of a deliberate strategy to remove the floor under wages and force them lower as a means of restimulating the economy. It is an amazingly convenient coincidence, is it not, that our slow recovery from the recession apparently depends on sacrifices made by the poor while we can afford more goodies for the rich. The Government is still at it. International research shows the most important factor in determining the rate of wage growth is workers’ ability to use collective bargaining to negotiate wage rates. This is not surprising; individual workers have little bargaining power in the face of powerful employers and in a labour market weakened by high unemployment. It is only by joining each other they have any hope of protecting their wage levels and working conditions. It is easy for those whose economic fortunes do not depend on collective bargaining to underestimate its importance, not only to trade union members but also to a properly functioning economy. The right to organise in a trade union is recognised as fundamental in international conventions and the Universal Declaration of Human Rights and is an essential element in ensuring that a market economy operates fairly and in everyone’s interest. But our Government is pressing ahead with so-called “reforms” that, in effect, remove the right to collective bargaining and allow employers to refuse to engage with their workers other than on an individual basis. Sadly, this is just one more step in the campaign to reinforce the disadvantage suffered by ordinary people when faced with the overwhelming power of their employers in an unregulated marketplace. It turns back the clock to a society disfigured by division and inequality and an economy that fails to fire because it serves an increasingly narrow interest. Last Wednesday was International Workers’ Day. May 1 is when workers around the world take to the streets to celebrate rights won on their behalf. In New Zealand, we focus our celebration on the victory of the eight-hour day. Most know carpenter Samuel Parnell as the champion of the eight-hour day. Parnell’s first employment contract for an eight-hour day was negotiated in February 1840, about the same time the Treaty of Waitangi was signed. Parnell’s success was his ability to convince his fellow tradesmen to meet a few months later in Wellington, where they resolved that no workman would work more than eight hours, and only between 8am and 5pm. The meeting agreed that any worker who breached the rule would be thrown in the harbour. We’d call it gangsterism today, but it lifted wages and made New Zealand the equitable society we once were proud of. It took another 59 years before the eight-hour day became law. The following year, in recognition of the regular marches that had been held each October to celebrate the eight-hour day, Parliament set our Labour Day as the fourth Monday of that month. 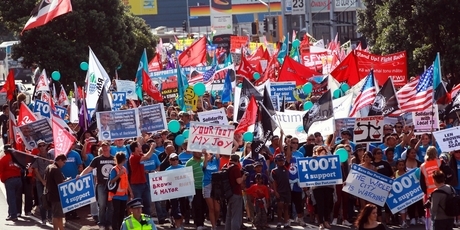 Although the date put us out of sync with the rest of the world’s May Day, unions in New Zealand have done their bit for international solidarity by hosting symbolic rallies on May 1. Until this year. This was the first time in the 35 years I have been in worker activism where there was no official event. That sadly reflects the shift of power between capital and labour in this country. It is telling that our Government has picked May 1 as the day that employers can now pay workers under 18 years old less than their older colleagues, even if they do the same work. Just to rub salt into the wounds, the Government has also introduced legislation this week that deletes the automatic right for workers to have rest breaks. But the real agenda is to undercut the ability of workers to fight for better deals. The Government this week proposed a change that means any employer isn’t required to stay in good-faith negotiations and can withdraw any time from negotiations. And even if the workers do achieve a union contract, the employer will be able to employ new workers on a lesser rate and inferior conditions. If a new applicant at their interview says they would like to be paid the union rate, the reality is they won’t get the job. You get the picture where this is going. Should workers decide to strike for a better deal, the Government has introduced all sorts of rules to thwart any disruption to the employer. 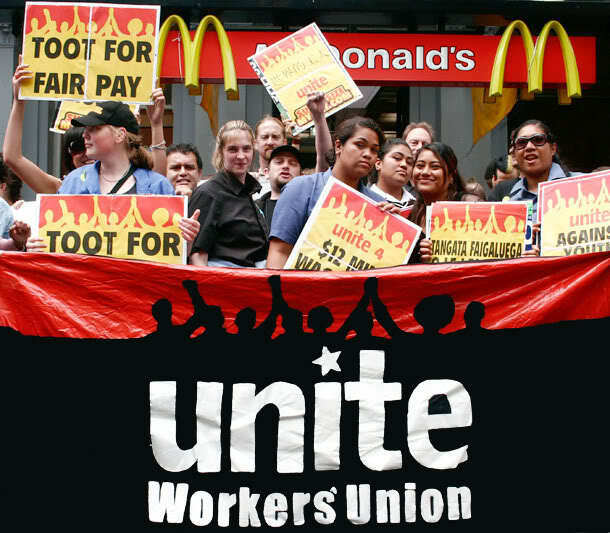 In spite of the obstacles, my union, Unite, did spend May Day supporting McDonald’s staff protests after their contract negotiations broke down. Twenty cops turned up at the Queen St store to aggressively shove the workers off the footpath. How nice for multinational companies to have our police force on call for picket-busting. Shame if anyone was the victim of a crime somewhere else. In a survey this week, 47 per cent of workers said they survived from one pay packet to the next. That’s because real wages are down 20 per cent since 1984, because successive governments have enacted laws that favour the powerful at the expense of working people. Samuel Parnell was on to something. Workers need to get together and dunk a few people. Debate on this article is now closed. 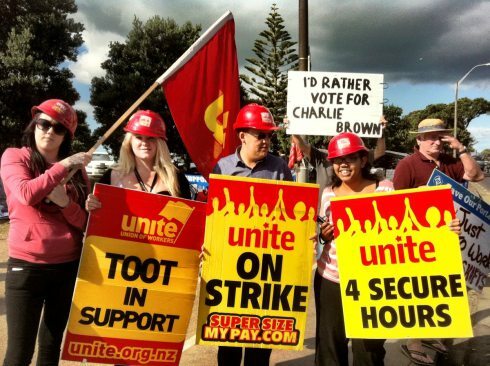 Unite Union is accusing the police of allowing themselves to be used at private security guards by the fast food giant McDonald’s NZ. 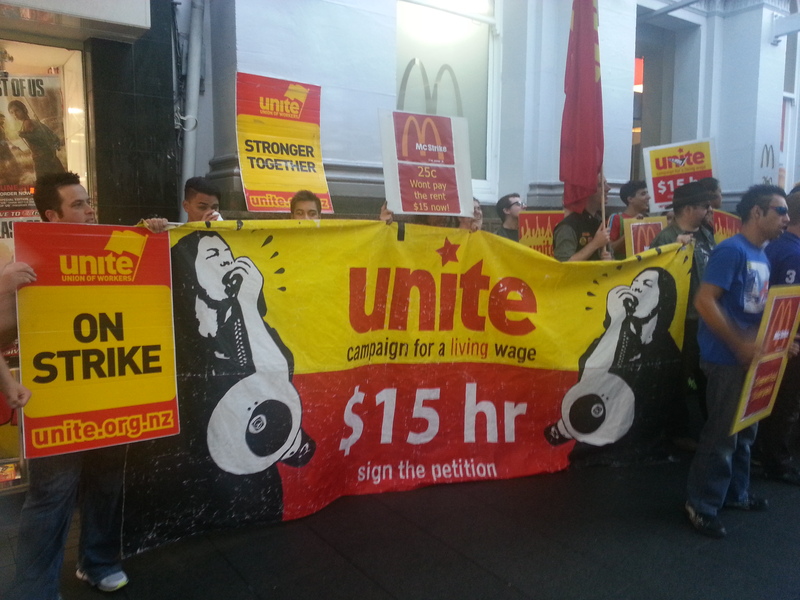 About 20 police were used to move a peaceful union picket away from the entrance to a McDonald’s restaurant in Queen Street in Auckland on May 1. Union members were picketing the store to protest the breakdown in negotiations over their collective agreement. After about an hour two paddy wagons turned up and forcibly shoved picketers aside. Unite national Director Mike Treen who was at the picket said at no time did the police say what was legally wrong with the picket. Youth rates are likely to take work away from other young workers not create new jobs. Industries that we represent employ tens of thousands of young workers. We have been told by these workers to resist the reintroduction of youth rates because they fear having their hours reduced because cheaper workers can be used instead. What people forget is that the days of full-time work being the norm is not true for young workers. No one in McDonald’s for example (other than managers) has guaranteed hours let alone full time work. So when head office says to managers “cut the labour budget in your store” a simple solution is to trim the hours of workers on higher rates and increase the hours of those on the so-called “starting out wage”. The starting out wage can also apply to 18 & 19 year-olds after 6 months on the dole. Big companies like McDonald’s are already getting a subsidy they don’t need for employing workers who have been on the dole for six months. Now they can pay them less for six months as well. these workers may already have experience in these or similar jobs yet they are expected to work for 20% less for six months. This doesn’t create work – it will simply shift it around. That is why we were told by all our McDonald’s delegates meetings prior to bargaining this year that the starting out wage was a no go area. We have told all the employers we are negotiating with that hell will freeze over before we sign an agreement containing youth rates. The simple reason that unemployment has gone up for young people is that the economy went into recession in 2008 and has barely recovered since. Many employers stopped hiring and older workers stayed in their jobs longer. This has created a bottleneck for young people. Cutting their wages won’t create new jobs however. It will reduce demand in the economy. New jobs needs a growing economy to produce them. That should be the government’s priority not cutting wages and reducing workers bargaining power with their other law changes. Unite National Director Mike Treen has started a blog hosted on the TheDailyBlog website. The site is sponsored by several unions and hosts some of new Zealand’s leading progressive commentators. It is worth checking out. Mike’s blog will be covering union news and general political comment but the views expressed are his own and not necessarily those of Unite Union. 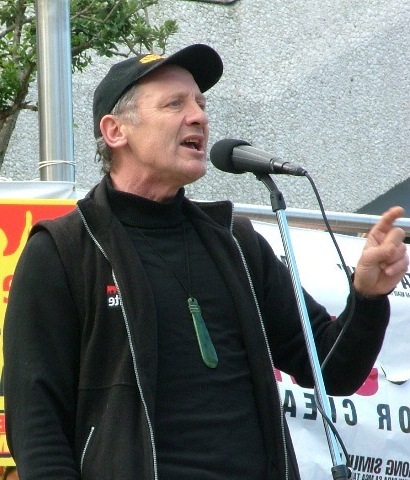 Mike Treen speaking to workers rally against proposed “right to sack” law in 2006.